The various reagents used in our industry are critical for the correct treatment of timber, yet they are spoken about very little. Reagents should be stored carefully, according to the instructions on the label, to ensure their shelf life. We have found that the use of these inexpensive materials can result in costly mistakes at the treatment plants, should the material not be correctly stored, or should it be kept past its due date. As we have seen this increasingly often, we decided to bring the issue to our customers’ attention. Expired reagents should never be used, as they become ineffective, either reacting too late or failing their purpose entirely. This could cause you a large, unnecessary expense or result in wood that is not properly treated, says our laboratory manager Navi Moodley. Reagents are increasingly used in our industry because there are wide variations in the timber that is treated, resulting in varying treatment requirements. 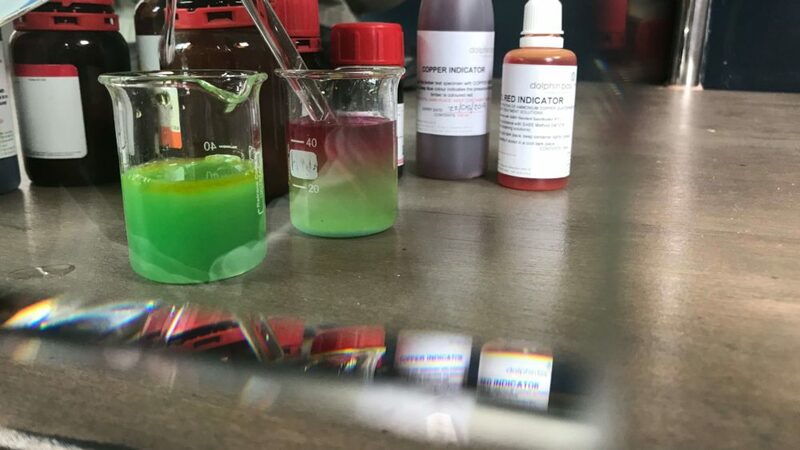 To address this variety, Dolphin Bay manufactures and sells a range of reagents to our customers: those used in the titration process, a heartwood indicator for eucalyptus poles, and a heartwood indicator for pine poles, to mention a few. The use of these inexpensive materials can result in costly mistakes at the treatment plants, should the material not be correctly stored. Most customers use up their reagents well before their expiry date. To ensure that they last this long – and most will last far longer – they should be stored in cool, dry conditions, as the label recommends, advises Navi. A fridge would be ideal if this is available. Let’s take a closer look at some of the primary reagents and what happens to the products when they expire. When exposed to air and dampness, sodium hydroxide liquid becomes sodium hydroxide flakes and water, while phenolphthalein will not decompose but, having a much lower boiling point than water, it evaporates relatively quickly. The reagents in the heartwood indicators decompose when exposed to too much light and heat, causing them to oxidise and their efficacy to wane.